Sliders, settings and other adjustments to make the game more realistic. I can't really say for the passing part, but as far as the scrambling goes, very rarely do I see a drop back followed by immediate scramble. I usually get around 3-5 carries by a scrambling QB per game, and most of those are after one or two seconds in the pocket. I kept an eye on this last night during a game and the QBs are good at going through progressions and taking short routes if they're open and not just slinging it way down field. Frankly, most of the long completions that I'm seeing with these settings are shorter routes where the DBs just miss the tackle and the WR is off to the races. Coming back after quite a while away from Madden. 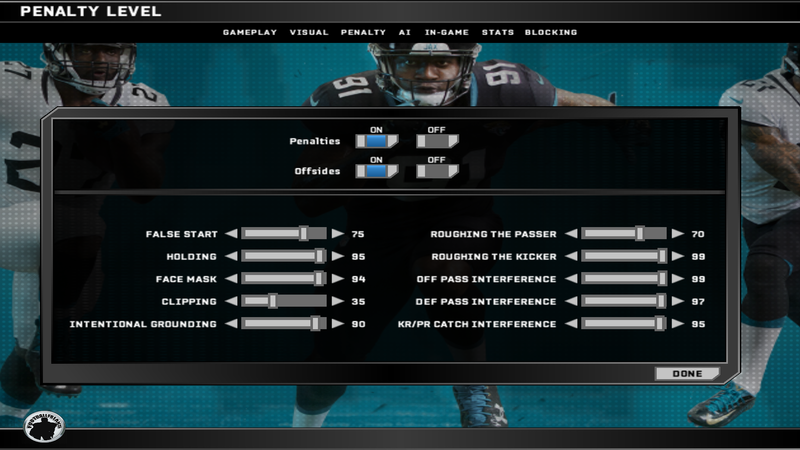 I'm looking for a set of sliders, coach aggression/philosophy settings, game settings and all that. 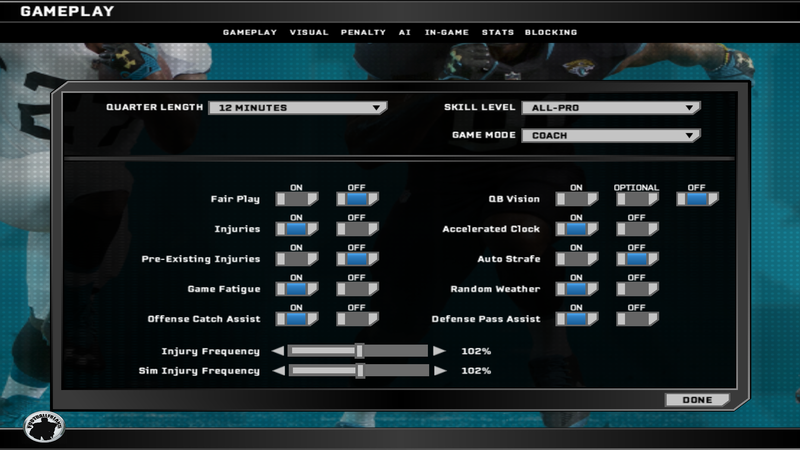 Can you post your most recent sliders you're using and the coach settings and game settings you're using? Also any other adjustments you've made? I saw a post earlier talking about the global adjustment to catch rating for defenders, are you using that? I assume you're using Calhoupe's scripts as well? Sorry if this a bit much to ask, I just don't have any of my old settings saved anywhere. I'll probably start playing again when the updated rosters are out and I manage to get all the mods installed. Coach Settings: change Run/Pass % to 25% Pass / 75% Run and Offensive Aggression at 30/70 for played games (ie, watched games). Simmed games Run/Pass % at 70% pass / 30% Run and Offensive Aggression at 30/70. KiT, thanks so much for your work on this. I'm finding, however, my games to be very low-scoring, defense heavy battles--game in, game out. Even great QBs like Brady almost never get more than 200 yards and I think not a single team I've seen in the 10 or so games I've gone through has scored >30 points. Are there any scripts I should be running that I'm not? Thanks very much. superboss555 wrote: KiT, thanks so much for your work on this. I'm finding, however, my games to be very low-scoring, defense heavy battles--game in, game out. Even great QBs like Brady almost never get more than 200 yards and I think not a single team I've seen in the 10 or so games I've gone through has scored >30 points. Are there any scripts I should be running that I'm not? Thanks very much. 30.4 carries per game, the NFL average is 26. Per team/per game rushing average of 106 yds, the NFL average is 108 yds. Per carry average of 3.5, the NFL average is 4.1. An average of 18.8 completions per game (NFL average is 22), 31.1 attempts per game (NFL average is 36), a completion % of 60.4 (NFL average is 63%), 265.6 yds per game (NFL average is 241), 1.73 TDs per game/per team (NFL average is 1.8), 0.53 ints per game/per team (NFL average is 0.8) and 2.2 sacks per team/per game (NFL average is 2.3). I'm satisfied with those numbers and am not going to make any additional tweaks at this time in my franchise file. The settings do cause team's to run slightly more than the NFL average (and at a YPC slightly below), but that seemed to cause closer more competitive games, which I was happy to see. Because I think it is nearly impossible to get the Yards Per Attempt stat down in the game to the NFL average of 6.7, I think the only way to have realistic Passing Yards Per Game is to set the coaching Pass/Run percentage so that in the game each team does not through the ball quite as much as a real NFL game. 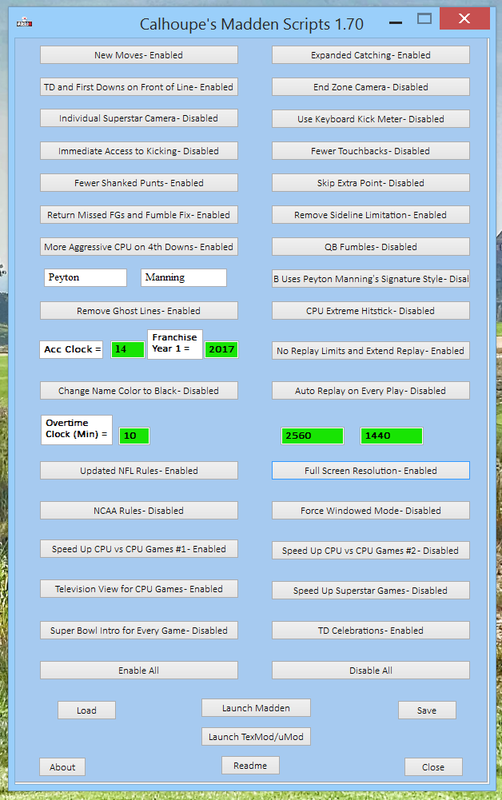 So, like I said, I am going to continue on with these settings. Thank you for the update, looking forward to trying it! rambolz wrote: Thank you for the update, looking forward to trying it! I ran another week's worth of games and have decided to make a couple tweaks... bump up Offensive Line Run Blocking to 34 and change Head Coach settings to 37% Pass / 63% Run (I had that at 35/65). That should bump up the YPC slightly and cause teams to pass a bit more than run. Here's a recent game log where the Texans defense dominated for 3 quarters then the Jags came storming back in the 4th quarter. I'm seeing good/realistic stats all around right now with the exception of the passing yards still being a touch too high. Passing stats look correct to me. The average Yards per Attempt (This is Passing Yards/Pass Attempts) so far in 2018 is 7.6 Y/A. Net Passing Yards (Passing Yards - Sack Yards/Passing Attempts + Sacks) is at 6.6 NY/A. Yards per Completion are at 11.6 Y/C. Passing Yards per game is at 247.8 Y/G.